In the dead of each Chicago winter, thousands of die-hard Cub fans gather downtown for three days of baseball fever. 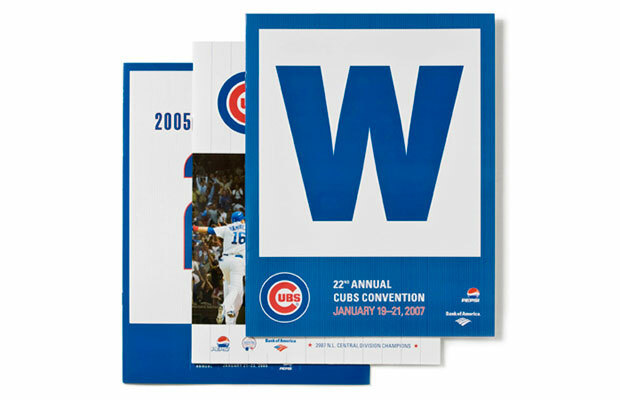 For nearly a decade, Petrick Design has helped the Cubs brand this event, the proceeds of which help fund Cubs Charities. We develop a graphic theme that unifies elements such as program guides, event passes, signs, pins and tee shirts. Petrick advised the Cubs to exploit Wrigley Field’s famous blue “W” as a marketing device. Convention passes for this year came in eight varieties so attendees could trade and collect them, like baseball cards. The 25th Anniversary Convention featured a poster timeline. 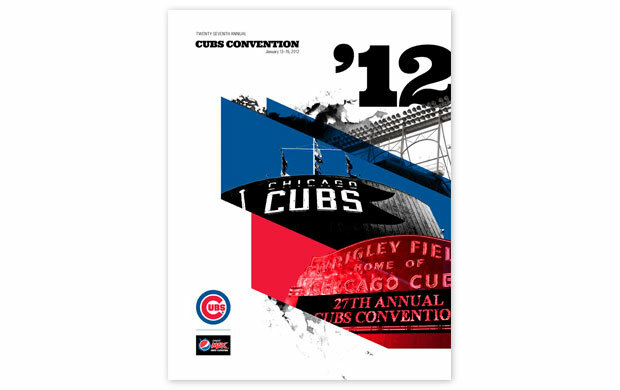 The program cover for the 2012 Convention exhibited a modernist theme. Petrick re-designed the event schedule into a user-friendly “TV Guide” format. Petrick Design is a design consultancy specializing in visual and verbal communication.